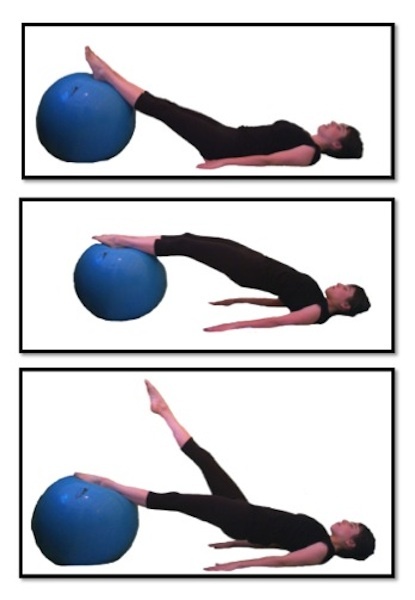 To do this exercise you will need a mat and a large exercise ball. Start by lying on your back with your feet on the ball. Be sure that your knees are long and straight. Inhale as you rock your pelvis to your tailbone, and then exhale as you rock your pelvis towards your belly button to engage your lower abdominals. Then continue lifting your pelvis into the air vertebra by vertebra until you are resting on your head neck and shoulders. From here take an inhale to prepare and then exhale as you lift one leg into the air with a straight and long knee. Inhale as you replace that leg back on the ball, and then exhale again as you lift the other leg. Repeat this movement 6-8 times on both legs. It is important to keep your pelvis stabile during this exercise. As you lift your leg into the air be sure that you are exhaling which will release the diaphragm and lift the pelvic floor for the most stability. The pelvis will also have a tendency to drop when you lift the leg. Be sure to press the standing leg into the ball to keep the hip extended so that the pelvis stays lifted.